The stories of the four Continental Congress Presidents and the ten Presidents of the United States in Congress Assembled serving before George Washington are inspiring narratives that are most appropriate to the events of the 21st Century. The account of the first US President, Samuel Huntington, is especially relevant as it focuses on an era when the United States Army and Congress met their greatest challenges in the Revolutionary War campaigns of 1780-1781. Amidst military mayhem (the loss of the Southern States to the British, former Continental Congress President Henry Middleton swearing his allegiance to the King George III, and Benedict Arnold burning Richmond after accepting a general’s commission in the British Army) the States managed to rally and finally ratify the first constitution in 1781 – The Articles of Confederation. The United States was established as a Perpetual Union just in time as our friends and foes alike accepted the unanimously ratified Articles of Confederation as evidence of one united country. Almost immediately France threw her military might behind General Washington enabling the decisive Victory at Yorktown. In 1781, despite winning our Independence militarily - "Mission Accomplished”, many 18th Century families whose sons made the greatest sacrifice were forced to suffer through an almost helpless unicameral (one branch) government that effectively failed to govern the United States. The monetary system nearly collapsed and by the summer of 1783 unpaid and unfed Pennsylvania Soldiers mutinied holding the entire United States in Congress Assembled with President Elias Boudinot hostage at Independence Hall. Even more remarkable, the Pennsylvania Militia refused a direct order from the President, Congress, and the Pennsylvania Supreme Council, whom were also held hostage, to free the founders from the new nation's most historic building. It was only through the efforts of future President Arthur St. Clair and Col.Alexander Hamilton that the mutineers finally acquiesced. On that fateful day a released Congress was force to flee from Philadelphia and reconvene in Princeton where they were protected by the NJ militia. 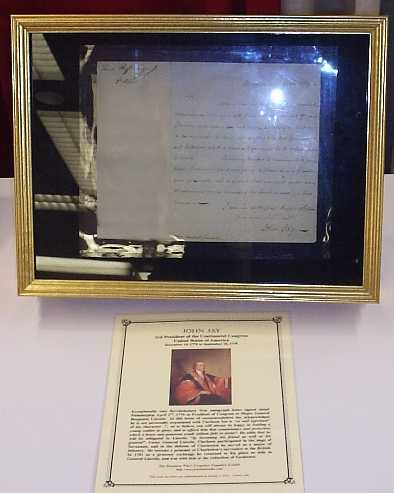 The 1783 letter from President Boudinot of “thanks” to Arthur St. Clair is on display at this exhibit (Chapter 10). In 1784 through 1786 the courts, taxes, voting irregularities, intrastate duties and laws were so rife with injustices that most citizens spoke of dissolving the Perpetual Unionof the United States of America. The year 1786 also saw the collapse of an Annapolis Convention to revise the Articles of Confederation and a citizen insurgence which will be forever known as Shays’ Rebellion which was not put down until March 1787. The United States Military managed to keep the peace after the war was won in these turbulent years of American Democracy. It was the military that provided the precious time, for the United States in Congress Assembled, to gather their best minds to revise the Articles of Confederation in Philadelphia in May of 1787. This time, when the confederation seemed doomed, George Washington accepted the Presidency of the Constitutional Convention and produced an entirely New Plan for the Federal Government - The United States Constitution which is on display at this Exhibit (Chapter 14). This new government was finally established in 1789 a full thirteen years after independence was declared in 1776. 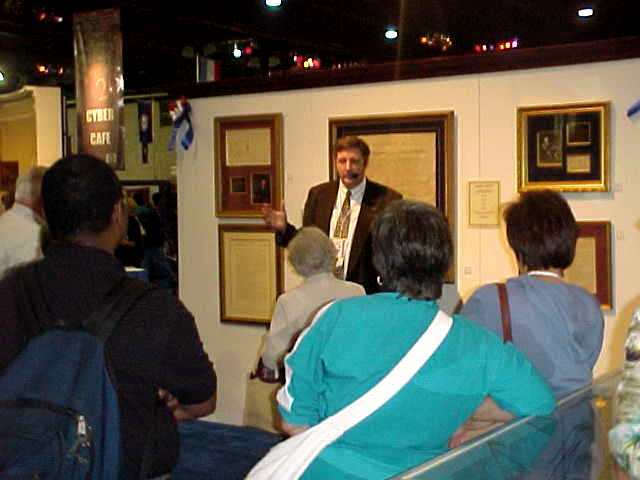 This exhibit, President Who? 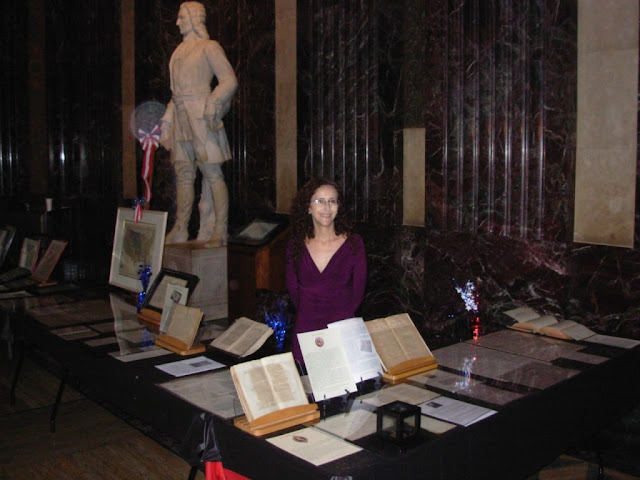 Forgotten Founders, goal is to educate you, the visitor, on this important period in U.S. Founding History. This was a time whenStatesmen and Philosopher Kings were the rule and not the exception in U. S. politics. The sacrifices these patriots made to secure the freedoms we now enjoy are immeasurable and in many cases most incomprehensible. Today, in a different era, we are at the crossroads of implementing a plan to preserve our freedom and it has taken us to the foreign shores of Iraq and Afghanistan. No longer protected by the great oceans the U.S. finds itself in an era of nuclear proliferation and terrorism so vile that it threatens the peace, freedom, and prosperities won and preserved by 11 generations of patriots for over 228 years. The United States of America, whether you agree or disagree with the mission in Iraq, must fulfill its mission and commitments to these two nations mustering the resources necessary to establish two governments of, for and by the Iraqi and Afghanistan people. The stories of the the U.S. founding and its struggle towards self-government aremost appropriate and filled with lessons on how to overcome the challenges now facing a free Iraq and Afghanistan. We must never forget that it was the 2nd constitution, not the 1st, enacted thirteen years after U.S. Independence in 1776 that finally established a body of law capable (with many amendments and a civil war) governing the United States of America. 2. 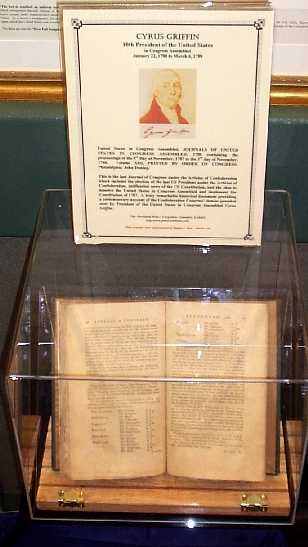 Which U.S. president wrote and introduced the resolution that declared U.S. Independence on July 2, 1776? 3. Which Continental Congress president signed George Washington’s commander-in-chief commission? 4. Which U.S. president conspired in the Conway Cabal to replace George Washington as commander-in-chief with General Horatio Gates? 5. Which U.S. president persuaded holdout Maryland to ratify the Article of Confederation in 1781, thereby creating the “Perpetual Union” known as the United States of America? 6. 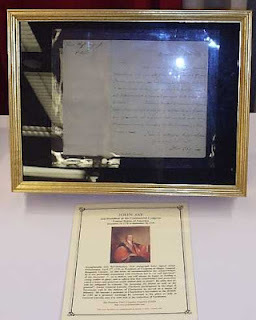 Which Continental Congress president was imprisoned in the Tower of London and later ex changed for General Cornwallis? 7. Which Continental Congress president persuaded John Adams and Benjamin Franklin to ignore the direct order of the United States in Congress Assembled demanding that France be included in the negotiations of the Treaty of Paris? 8. Which U.S. president negotiated the peaceful release of President Elias Boudinot and the entire Continental Congress from Independence Hall in the summer of 1783? 9. 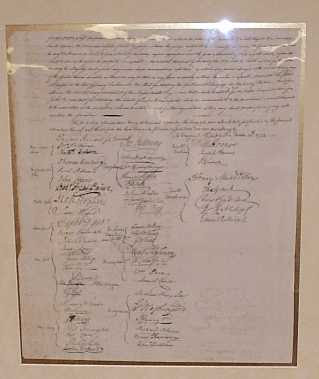 Which U.S. president’s signature ratified the treaty that ended the war with England? 10. Which U.S. president sponsored the legislation to hold the 1787 Constitutional Convention in Philadelphia after the Annapolis Convention failed to reach a quorum in 1786? 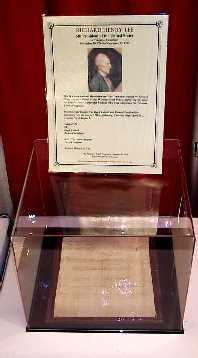 A Five Pound Virginia Colonial Note dated March 4, 1773 and signed by Continental Congress President Peyton Randolph, US Constitution Signer and Supreme Court Justice John Blair on the front. It is also signed on the reverse by Virginia Treasurer Robert Carter Nicholas. 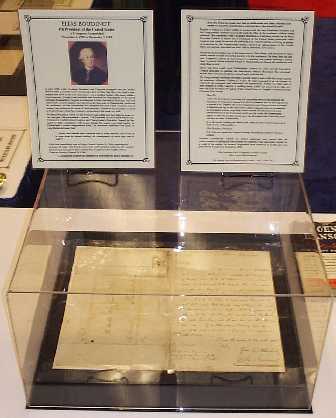 This historic note is in exceptional condition measuring 5 x 6 1/2 inches. Peyton Randolph traveled to Pennsylvania and Continental Congress was officially formed on September 5, 1774 in Philadelphia's Carpenters Hall to petition King George III after England passed the Intolerable Acts. The first unofficial meeting of delegates actu­ally took place the day before in The City Tavern just down the street (yes the true birthplace of the Continental Congress and the Presidency was in a Philadelphia tavern). The debates at this tavern meeting were significant as the decision was made to hold the First Continental Congress in a private, rather than public hall. When Congress convened the next day, South Carolina delegate Thomas Lynch nominated Peyton Randolph to be chairman. Peyton was elected by unanimous vote. A Printing of the October 24th, 1774 Address to the People of Great Britain and To the Inhabitants of the Colonies signed by Henry Middleton and the other founding members of the Continental Congress. In the summer of 1775 Delegate Benjamin Franklin realized the easily changeable resolutions and The Articles of Association that formed the Continental Congress needed to be restructured to form a true “constitution” for the United Colonies. In July Franklin presented his new plan for the colonies as the Articles of Confederation of the United Colonies of North America. The Continental Congress, upon a cursory review of this important work, tabled the measure on July 21, 1775 only to revisit the Articles in the spring of 1776 when the colonial leaders were in full rebellion against Great Britain. This complete printing of Franklin’s Articles is published in this January 1776 issue of The Gentlemen’s Magazine, London England. The phraseology "Taxes … are imposed upon the people without their consent" is the best one could hope for in the early rhetoric of the American Revolution. The"no taxation without representation" slogan sounds good orally, but would be completely out of character in writing of the period. This "No Taxation" circular document is important not just for its content as it is signed by John Hancock. President Hancock was the only "signer" to actually autograph the Declaration in July of 1776 (the other members signed August 2nd, 1776). He was the President of Continental Congress and a key force in making Independence a reality. While historians can argue whether John Adams, Samuel Adams, or James Otis, was more important at the beginning of the revolution, Hancock is without question valued more highly. The issue of taxation without representation was first raised by James Otis in 1764, but the only documents of similar content are a few printed pamphlets from 1765 through 1768. None of the documents are signed. 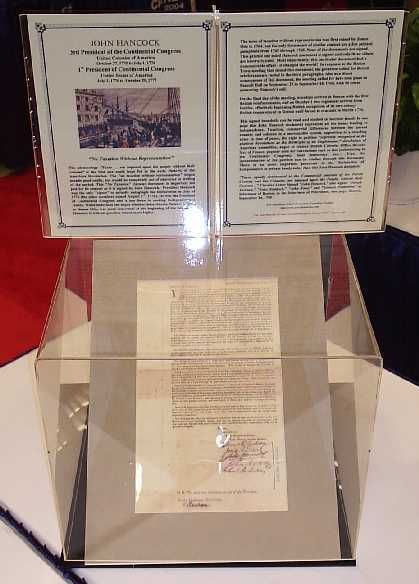 This printed one sided Hancock document is signed and only three others are known to exist. Most importantly, this particular document had a demonstrable effect - it changed the world! In response to the Boston Town meeting that issued this document, the governor called for British reinforcements (noted in the third paragraph). Also as a direct consequence of this document, the meeting called for here took place in Faneuil Hall on September 23 to September 28, 1768, with 96 towns answering Hancock’s call. On the final day of the meeting, warships arrived in Boston with the first British reinforcements, and on October 1 two regiments arrived from Halifax, effectively beginning British occupation of its own colony. British troops stayed in Boston until forced to evacuate in March 1776. "Taxes equally detrimental to the Commercial interests of the Parent Country and her Colonies, are imposed upon the People, without their Consent…" Circular Letter Signed "John Hancock," also signed "Joseph Jackson," "John Ruddock," "John Rowe," and "Samuel Pemberton" as Selectmen of Boston, to the Selectmen of Petersham, one page; Boston, September 14, 1768. A Revolutionary War Letter Signed dated April 30, 1777 Philadelphia. By the spring of 1777 Fort Ticonderoga, now in the hands of the United States, had fallen in disrepair with only a handful of Continental troops protecting the northern passage. When it became clear that the British, under General Burgoyne, were marching to retake the fort, Congress quickly ordered Major General Arthur St. Clair to command and defend Fort Ticonderoga. 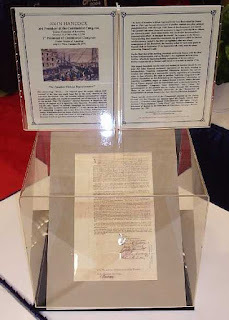 This crucial Presidential Order is signed byJohn Hancock as President of the Continental Congress, United States of America. Continental Congress Military promotion stating "In Congress -- The Delegations of the United States of New Hampshire, Massachusetts-bay Rhode Island and Providence Plantations, Connecticut, New York, New Jersey, Pennsylvania, Delaware, Maryland, Virginia, North Carolina, South Carolina and Georgia to ... " which was commonly used before the Articles of Confederation were ratifies. This Military order is signed by Henry Laurens as President and Charles Thomson as Secretary of the Continental Congress which was left undated and blank. The conducting of the war under the un-ratified Articles of Confederation actually proved to be a blessing for the new government. No President circumvented the ineffective Articles more then Henry Laurens during those thorny days of the Revolutionary War. Military Appointments and promotions were the responsibility of the Confederation Congress but they were constantly on the move during Laurens Presidency due to British battlefield successes which included capturing Independence Hall. To expedite promotions and appointments President Laurens and Secretary Thomson signed numerous blank appointments leaving them to be filled out by the filed commanders. Exceptionally rare Revolutionary War autograph letter signed dated Philadelphia April 2nd, 1779 as President of Congress to Major General Benjamin Lincoln. In this letter of recommendation Jay acknowledges he is not personally acquainted with Clarkson but is "so well informed" of his character ".. as to believe you will always be happy in leading a young soldier to glory, and to afford him that countenance and protection which a brave and generous youth seldom fails to invite". 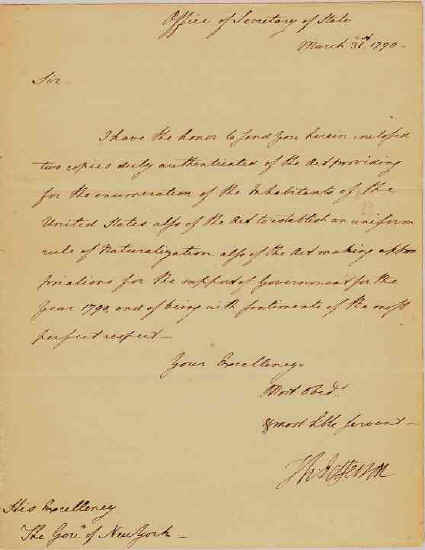 He adds that he will be obligated to Lincoln "by becoming his friend as well as his general". Under General Lincoln, Clarkson participated in the siege of Savannah, and in the defense of Charleston he served as a major of infantry. He became a prisoner at Charleston’s surrender to the British. In 1781 as a prisoner exchange he returned to his place as aide to General Lincoln, and was with him at the reduction of Yorktown. Letter Signed as President to Caesar Rodney, dated November 13th, 1780 Philadelphia only 6 months after Benjamin Lincoln surrendered to British Forces in Charleston, South Carolina. During this dark period for the Continental Army the British, who controlled the South, were making liberal use of papers and clearances that they took from this great southern “prize.” In this letter a beleaguered President Huntington urges Caesar Rodney of Delaware to support his resolution, adopted at the urging of Minister of France, to deal with the problem of British Spies and their disruption of US trade with France. Partly-printed "United States of America in Congress Assembled" Military Appointment signed "Saml: Huntington President" as President dated February 24, 1781 in Philadelphia just four days before the formal acceptance of the ratification of the Articles of Confederation by the Continental Congress. This partly printed parchment appoints Isaac Bronson "Surgeons Mate in Col. Sheldons Regiment of Light Dragoons...." It is countersigned by Joseph Carleton as Secretary of the Board of War. Although the Military Appointment heading states: The United States of America in Congress Assembled the Perpetual Union of the United States was not formed until March 1, 1781. Maryland, the last holdout reported to Congress on February 12, 1781 that their State had ratified the Articles on February 2, 1781. These partly printed documents were most likely produced in anticipation of the formal acceptance of the Articles on March 1. Note the difference of this military appointment from the one signed by Henry Laurens in 1778 whose heading states "In Congress -- The Delegations of the United States of New Hampshire, Massachusetts-bay Rhode Island and Providence Plantations, Connecticut, New York, New Jersey, Pennsylvania, Delaware, Maryland, Virginia, North Carolina, South Carolina and Georgia to ..."
Isaac Bronson went on to be one of New York City’s most influential businessmen founding the New York and Ohio Life Insurance Companies. This is an official printing of The Journals of the United States in Congress Assembled Published By Order Of Con­gress, Volume VII New York: Printed by John Patterson in 1787. 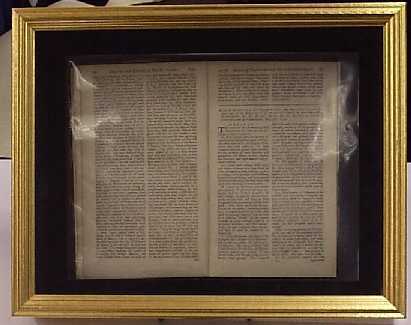 This 18th Century Journal includes the full printing of the Articles of Confederation and the installment of Samuel Huntington as President of the United States in Congress Assembled. 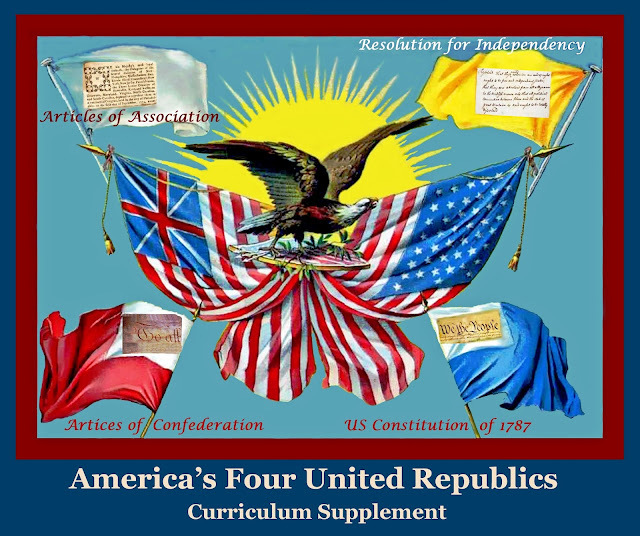 By virtue of the ratification of “The Perpetual Union” the ever fluid Continental Congress ceased to exist and on March 2nd "The United States in Congress Assembled" was placed at the head of each page of the Official Journal of Congress. The United States of America, which was con­ceived on July 2, 1776, had finally been born in 1781 under the watch of President Samuel Huntington. 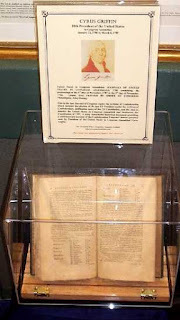 IN pursuance of an Act of the Legislature of Maryland, intituled, "An Act to empower the Delegates of the State in Congress to subscriber and ratify the Articles of Confederation," the Delegates of the said State, on Thursday last, at twelve o, signed and ratified the Articles of Confederation; by which act the Confederation of THE UNITED STATES OF AMERICA was compleated, each and every of the Thirteen States, from New Hampshire to George, both included, having adopted and confirmed, and by their Delegates in Congress ratified the same. This happy even was immediately announced to the public by the discharge of the artillery on land, and the cannon of the shipping in the river Delaware. At two his Excellency the President of the United States in Congress received on this occasion the congratulations of the Hon. the Minister Plenipotentiary of France, and of the Legislative and Executive Bodies of this State, of the Civil and Military Officers, sundry strangers of distinction in town, and of many of the principal inhabitants. Thus will the first of March, 1781, be a day memorable in the annals of America, for the final ratification of the Confederation and perpetual Union of the Thirteen States of America --- A Union, begun by necessity, cemented by oppression and common danger, and now finally consolidated into a perpetual confederacy of these new and rising States: And thus the United States of America, having, amidst the calamities of a destructive war, established a solid foundation of greatness, are growing up into consequence among the nations, while their haughty enemy, Britain, with all her boasted wealth and grandeur, instead of bringing them to her feet and reducing them to unconditional submission, finds her hopes blasted, her power crumbling to pieces, and the empire which, with overbearing insolence and brutality she exercised on the ocean, divided among her insulted neighbours. 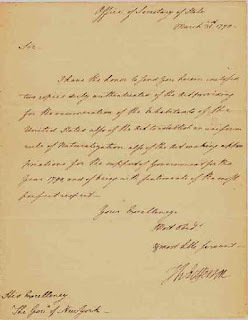 An October 19th, 1781 autograph letter attested by Jos: Carleton the Secretary of the Board of War commending Surgeon John Thomas, Esquire for serving with the 8th Massachusetts Regiment since January 1, 1777 and ordering him to “… faithfully & diligently to discharge the duty of Surgeon…”. The letter details Mr. Thomas’ duties under the new United States in Congress Assembled. It is Signed Thomas McKean president of the Congress of the United States of America at Philadelphia the 19th day of October 1781 and in the sixth year of our Independence. 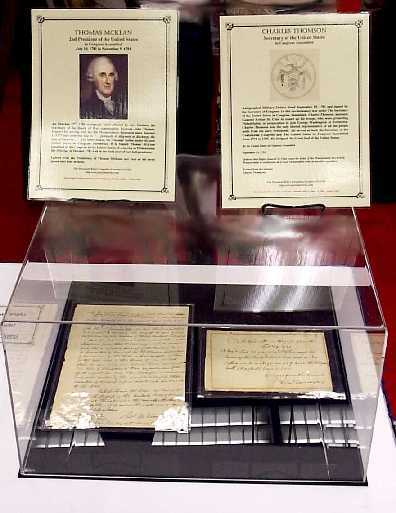 Letters from the Presidency of Thomas McKean are rare as his term lasted only four months. 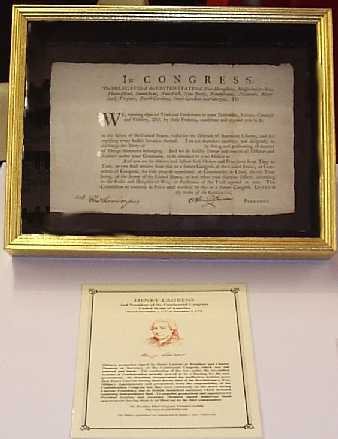 This letter is displayed with Autographed Military Orders dated September 19, 1781 under McKean's Presidency but signed by the Secretary of Congress. In this revolutionary war order The Secretary of the United States in Congress Assembled, Charles Thomson, instructs General Arthur St. Clair to round up his troops, who were protecting Philadelphia, in preparation to join George Washington at Yorktown. Charles Thomson was the only elected representative of all the people aside from the early Presidents. He served as both the Secretary of the Continental Congress and The United States in Congress Assembled from 1774 to 1789. He designed the Great Seal of the United States. Ordered that Major General St. Clair cause the levies of the Pennsylvania line now in Pennsylvania to rendezvous at or near Philadelphia with all possible exposition. To all people who shall see these presents, send greeting. Whereas justice and humanity and the practice of civilized nations, require that the calamities and asperities [SEAL] John Hanson Chas. Thomson, Secy. of war should as far as possible be mitigated; and we being disposed for that benevolent purpose to accede to a general cartel between the United States of America and the British nation, for the exchange, subsistance and better treatment of all prisoners of war: Now therefore know ye, that reposing high confidence in the wisdom, prudence and integrity of our trusty and well beloved George Washington, esq. our Commander in Chief of all our armies, raised and to be raised for the defence of the United States of America, we have authorised sad empowered, sad by these presents do authorise and empower, our said Commander in Chief, for us and in our name, to negotiate, accede to and establish, in the proper forms and with the usual solemnities, such general cartel between the United States in Congress assembled, and the king of Great Britain, for the exchange, subsistance and better treatment of all prisoners of war, as well land as naval prisoners; hereby giving and granting to our said Commander in Chief full power and authority, ultimately and on all points, to adjust and conclude the principles, terms and conditions of the said cartel, and in general to do and perform every matter and thing which shall in any wise be necessary for the final and perfect accomplishment thereof. And the better to enable our said Commander in Chief to execute the trust reposed in him by these presents, we do hereby further authorise sad empower him, from time to time, by commission under his hand and seal, to nominate and constitute such and so many commissioners as he shall judge necessary, to meet, treat, confer and agree with commissioners to be appointed and competently authorised on the part of the king of Great Britain, touching the terms, conditions and stipulations, for subsisting, better treating and exchanging all prisoners of war as aforesaid, as well as for liquidating and settling all accounts and claims whatsoever, respecting the maintenance and subsistance of prisoners of war on either side. And we do hereby declare that the engagements concluded upon by our said Commander in Chief in the premises, being mutually interchanged with the party contracting on behalf of the crown and nation of Great Britain, shall be binding and conclusive on the United States of America. In testimony whereof we have caused these our letters to be made patent, and the great seal of the United States of America to be thereunto affixed. 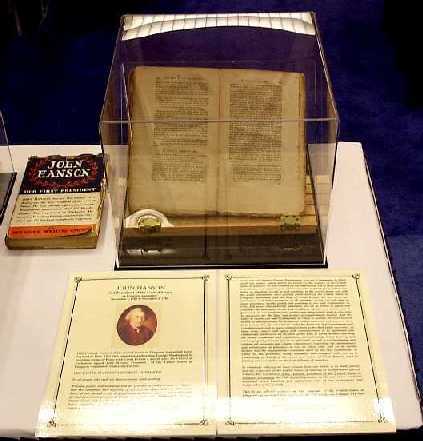 Witness his Excellency John Hanson, President of the United States in Congress assembled, the 16th day of September, in the year of our Lord one thousand seven hundred and eighty-two, and of our sovereignty and independence the seventh. 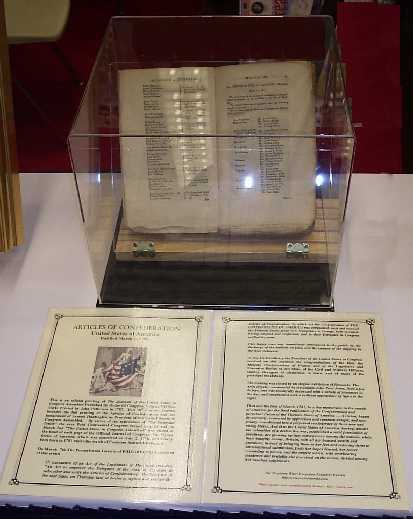 This is an official printing of The Journals of the United States in Congress Assembled Published By Order Of Con­gress, Volume VII New York: Printed by John Patterson in 1787. In July 1783, while President Boudinot and Congress struggled with the treaty, massive debt, a corrupt court system and a host of other ills, they were dealt a now unthinkable blow to the new democracy. On a sizzling Sunday afternoon, soldiers from Lancaster, Pennsylvania mutinied and marched for Philadelphia for the stated purpose of com­pelling Congress to relinquish to their demands of back pay, food and desperately need­ed supplies. Recruits from the barracks in Philadelphia reinforced the mutineers; as they surrounded the Independence Hall where Congress was in session, they numbered in excess of three hundred. Moreover, the Executive Council of Pennsylvania’s State Government was meeting at the same very hall. "…unless their demand were com-plied with in twenty minutes, they would let in upon them the injured soldiery, the consequences of which they were to abide." Thanks to Arthur St. Clair’s ability to reason with the men, President Boudinot and the Congressional members passed through the files of the mutineers without being molest­ed. The committee, with Alexander Hamilton as chairman, waited on the State Executive Council to insure the Government of the United States protection when Congress was ready to convene the following day. Elias Boudinot, receiving no pledge of protection by the Pennsylvania militia, advised an adjournment of the United States in Congress Assembled on June 24th to Princeton, New Jersey. President Elias Boudinot now in his home state of New Jersey, and protected by their mili­tia, wasted no time in dealing harshly with the mutineers. On June 30th, the day after Congress's arrival in New Jersey, a resolution was passed ordering General Howe to march fifteen hundred troops to Philadelphia to disarm the mutineers and bring them to trial. Before this force could reach Philadelphia, General St. Clair and the Executive Council succeeded in quieting the disturbance without bloodshed. The principal leaders were arrested, obedience secured and a trial was set. I duly recd your favor of yesterday but conceiving that you had mistaken the Resolution of Congress, I showed it to Mr. Fitzsimmons and we have agreed not to present it to Congress, till we hear again from you. Congress were so careful to interfere one way or the other in the military etiquette, that we recommitted the Resolution to have every thing struck out that should look towards any determination as to the Command, and it was left so that the Commanding officer be him who it might, was to carry the Resolution into Execution; and it can bear no other Construction. P. S., You may depend on Congress having been perfectly satisfied with your conduct. Boudinot undoubtedly trusted St. Clair’s judgment and spared him the embarrassment of making his letter known to Congress. Peace once again reigned. As a result of the mutiny the accused ringleaders were sentenced to death, but were pardoned by Congress in September 1783. President Thomas Mifflin was also a Revolutionary War General. 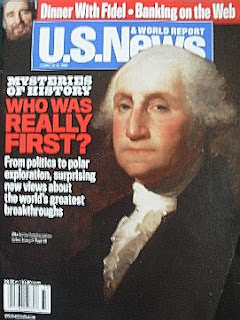 He was accused of conspiring unsuccessfully with Generals Horatio Gates and Thomas Conway to remove George Washington from his office of Commander-and-Chief in 1777. In an ironic twist of fortune General George Washington on December 23d, 1783, at a time when the people were calling for him to be King, resigned his Commission as Commander-and-Chief to none other then to President Thomas Mifflin the very man who conspired in 1777 to remove him from this very office. This promissory note “Borrowed 2nd August 1784 of … Twenty-two pounds in Philefs to be accounted for on demand Thomas Mifflin” was executed in the year of his Presidency demonstrating the sacrifices these Presidents made serving their country with no salary compensation. Demands from Mifflin’s creditors finally forced him to leave Philadelphia and he died in Lancaster in 1800 at 56. Pennsylvania remunerated his burial expenses at Trinity Lutheran Church. This is a very unusual Revolutionary War Document signed by Richard Henry Lee as Colonel of the Westmoreland Militia approving payment for hours of two Continental Soldiers who were patrolling the Potomac River in Virginia. Westmoreland County D to Hugh Luttrell and Richard Sandford for patroleing (sic) the year of 1780 as following: Thursday Night April 20 … Tuesday Night August 8. According to the Iron Act of 1750, iron manufacture was prohibited in the colonies and all pig and bar iron was to be shipped to Great Britain for finishing. Many Colonial merchants and manufacturers skirted these laws and future President Gorham’s business was no exception to circumventing these British Laws. While most of the arms used during the American Revolution were of European manufacture, some of the numerous New England iron furnaces did supply shot, shells and the occasional cannon. 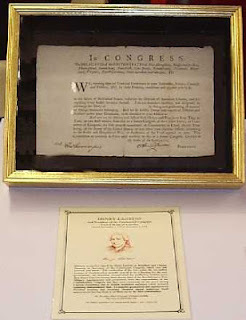 A rare document signed on partly printed parchment 12" x 7½" dated October 20th, 1787 New York. This Articles of Confederation Military Commission is for the appointment of Jacob Kingsbury as Lieutenant in the Army of the United States which, is boldly signed "Ar. St. Clair" as President of The United States of America in Congress Assembled. The appointment is also signed by "H(enry) Knox" as Secretary of War with an intact United States War Department Seal. 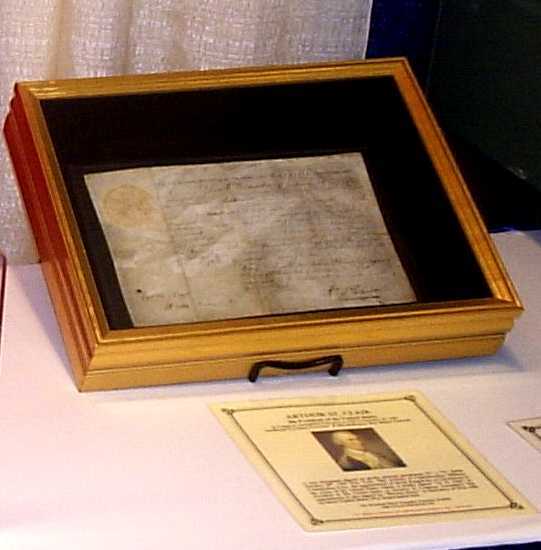 Arthur St. Clair's Congress passed two of the most important pieces of laws ever enacted the Northwest Ordinance and the United States Constitution of 1787. As recognition for his Herculean work as US President Arthur St. Clair was named Governor of the Northwest Territory shortly after he executed this commission. In June, St. Clair decided to recycle Jefferson's Ordinance of 1784 as the blueprint for national expansion to the West. This ordinance had failed enactment for nearly three years. It was a combination of the dire need for federal money and President Arthur St. Clair’s leadership that the Confederation Congress, on July 13, 1787, passed one the most far-reaching acts in American history, the Northwest Ordinance. Additionally, this plan for governing the Northwest Territory included freedom of religion, right to trial by jury, the banishment of slavery, and public education as asserted rights granted to the people in the territory. This ordi­nance was and still remains one of the most important laws ever enacted by the govern­ment of theUnited States. "We are accustomed to praise lawgivers of antiquity ... but I doubt whether one single law of any lawgiver, ancient or modern, has produced the effects of more distinct, marked, and last­ing character than the Ordinance of 1787"
DID Someone leak the Constitution ? This "Plan of the New Federal Government," previously unrecorded, is, arguably, the first public printing of the U.S. Constitution. The folio broadsheet is dated September 17th, 1787 three times in the text and boldly marked "Philadelphia: Printed by ROBERT SMITH." 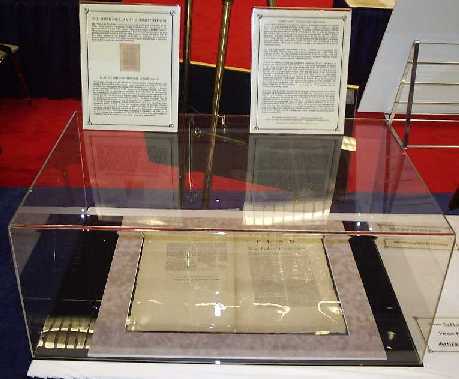 This unique printing is the ultimate testament of a publisher utilizing freedom of the press privileges, soon to be enshrined in the Bill of Rights. Robert Smith’s folio appears to be the first public printing of the formerly secret plan to reorganize the unsuccessful Confederation Government of the United States in Congress Assembled into a true nation, the United States, governed under the Constitution. "It was a leak. He scooped the five Philadelphia major newspapers by thirty-six hours!" says Stanley L. Klos, presidential historian and author of President Who? Forgotten Founders. 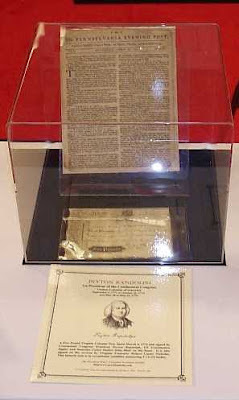 Some historians maintain that this printing of the Constitution was included as an insert to Smith’s September 18th, 1787 bi-weekly newspaper, The Evening Chronicle. Klos notes, however, that "The Evening Chronicle’s proximity to Independence Hall, the adjournment of the Constitutional Convention at 4 p.m. on the 17th, and Smith's previous employment with Dunlap gave him immediate access to Dunlap's official delegate printings, with the lifting of the delegates' oath of secrecy. Additionally, Klos insists, “The degree that Smith’s ‘Plan of the New Federal Government’ matches the September 17th Constitution transmittal letter executed by George Washington, and the hastily printed offsets and misspellings found throughout Smith’s printing, indicate the broadsheet, unlike his bi-weekly “Evening Chronicle," was prepared in great haste. 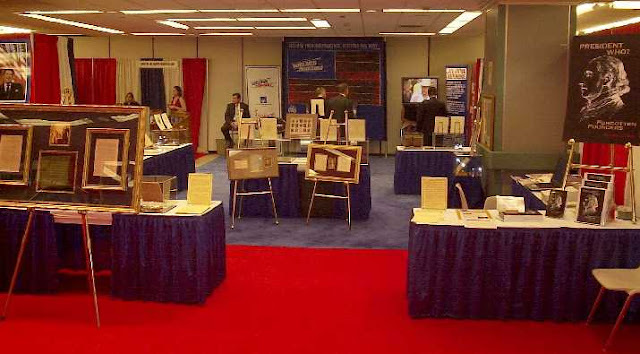 Whether the 17th or 18th, this struggling newspaper publisher may have trumped all five major Philadelphia newspapers that released their editions of the United States Constitution on September 19th, 1787. All of the first printings of the Constitution are rare, but this broadsheet is the only known issue of Smith's "Plan of the New Federal Government" in private or public hands. Whatever the case, the 17th or 18th, this struggling newspaper publisher trumped all five major Philadelphia Newspapers who released their editions of the United States Constitution on September 19, 1787. Smith’s September 17-18th , 1787 broadsheet is the only known issue of "New Plan for the Federal Government" in private or public hands. from its colophon that this broadsheet was printed before the merger. The last Evening Chronicle issue known to be printed is vol. 2, no. 104, dated November 7, 1787, a copy of which can be found in the collection of the American Antiquarian Society. Very little is known about Robert Smith as he was a publisher, never a proprietor of a press. (Charles R. Hildeburn, Issues of the Press in Pennsylvania 1685 – 1784) This is why Smith and his work have been overlooked in the histories of colonial printing, which tend to focus on such men as Paul Revere, Benjamin Franklin, Christopher Sauer and Dunlap and Claypoole, who owned or operated independent presses. We do know that Robert Smith was first listed as a printer in 1783 at “… the Back of the Fountain Inn between Second and Third Street…” in downtown Philadelphia. On January 1, 1785 he joined Dunlap and Claypoole's Pennsylvania Packet and remained with them until late 1786. In that same year, Smith re-opened his business at the White-Horse and Fountain Inn. It wasn’t until February 1787, with the launch of the The Evening Chronicle; or, Philadelphia Advertiser that Smith moved again, “Next to the Coffee-House in Front." (A Directory of the Book-Arts and Book Trade in Philadelphia to 1820. Including Painters and Engravers) Finally, Smith relocated his business, during the Constitutional Convention, to “Below the Drawbridge, third door below Spruce, in Front and Water,” less then ½ mile from Independence Hall. This location, Smith’s Dunlap contacts, and other factors, made him the ideal candidate to quickly print the U.S. Constitution once the resolution of secrecy had ceased. "Smith presumably felt his broadsheet would benefit by a headline. But what should it read? At this stage the U.S. Constitution was a new proposal and not yet the law of the land. In other words, it was a constitution, but not yet the U.S. Constitution. In 1787 there was an existing confederate system of government, set forth in the Articles of Confederation. To avoid confusion and to simultaneously convey the import and political philosophy of the newly proposed constitution, Smith (as publisher) employed a more descriptive and informative title 'Plan of the New Federal Government.' It is certainly a very effective headline, as it properly orients new readers to what they can expect from the document." Unfortunately, this historic scoop wasn't enough to save the fledgling paper. Smith’s Evening Chronicle went out of print in November 1787. For more information visit --- USConstitution.info. "Plan OF The NEW Federal Government"
United States in Congress Assembled, JOURNALS OF UNITED STATES IN CONGRESS ASSEMBLED, 1788 containing the proceedings of the 5th Day of November, 1787 to the 3rd day of November, 1788. Volume XIII, PRINTED BY ORDER OF CONGRESS, Philadelphia. John Dunlap. This is the last Journal of Congress under the Articles of Confederation which includes the election of the last US President under the Articles of Confederation, ratification news of the US Constitution, and the plan to dissolve the United States in Congress Assembled and implement the Constitution of 1787. A truly remarkable historical document providing a contemporary account of the Confederation Congress’ demise presided over by President of the United States in Congress Assembled Cyrus Griffin. In this letter dated August 30th George Washington, 1st President under the Constitution transmits to Gov. Samuel Huntington 1st US President under the Articles of Confederation two acts; an order to survey the Ohio Territory and The Treaty of Hamar before obtaining advice and consent of the US Senate. 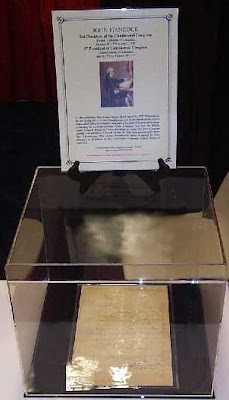 When President George Washington took office in March 1789 the Treaty of Hamar was a positive and pressing accomplishment of the Northwest Governor. This was to be the first US Treaty under the US Constitution and extremely important as it opened a large area in the Northwest Territory for expansion. Washington submitted the treaties executed by Gov. St. Clair to the US Senate on May 25, 1789. The President mistakenly assumed such submission met the new constitutional requirements and he proceeded notifying all the Governors of this accomplishment. The US Senate, however, tabled the treaty forcing Washington to re-approach the legislators in September 1789. The treaty, our first under the US Constitution, was a constitutional blunder on the part of the new administration but it was overshadowed due to the US Senate’s deliberation and ratification on September 22, 1789. 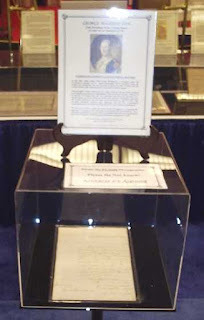 Letter signed “Th: Jefferson,” as Secretary of State, to New York Governor George Clinton, relating to copies of the first census of the United States, an act to establish a uniform rule of naturalization and an act making appropriations for the support of Government for the year 1790 which was the first full budget of the United States of America under the US Constitution. These are three pivotal laws at the very foundation of our government. This letter is particularly significant because Governor Clinton who opposed the US Constitution was now obliged to see the Great State of New York follow federal government mandates for immigration and population census. Washington wisely left the transmittal of these laws to his “Pro-States Rights” Secretary of State Thomas Jefferson.